He’s greeted by wide-eyed smiles, gets asked all kinds of off-the-wall questions, and gives countless pats on the back. For Luke Gazdic, taking part in a summer hockey camp is everywhere he wants to be. When he got the call asking to be a special guest at the Edmonton Oilers Hockey School about a month ago, Gazdic didn’t waste any time in accepting the offer. Growing up in Toronto, Gazdic had plenty of opportunities to skate with several big leaguers throughout his time at summer hockey camps. Gazdic still breaks into a big grin when he recites the names of some of the players he met years before he reached the Ontario Hockey League ranks with the Erie Otters. It’s a big reason why the former 172nd overall pick of the Dallas Stars in 2007 doesn’t mind going the extra mile to help out a kid in need. Not too long ago, Gazdic had his locks and beard shaved off with some help from his friend Avena, for her Hair Massacure fundraiser, which supports children in Alberta with life-threatening diseases. 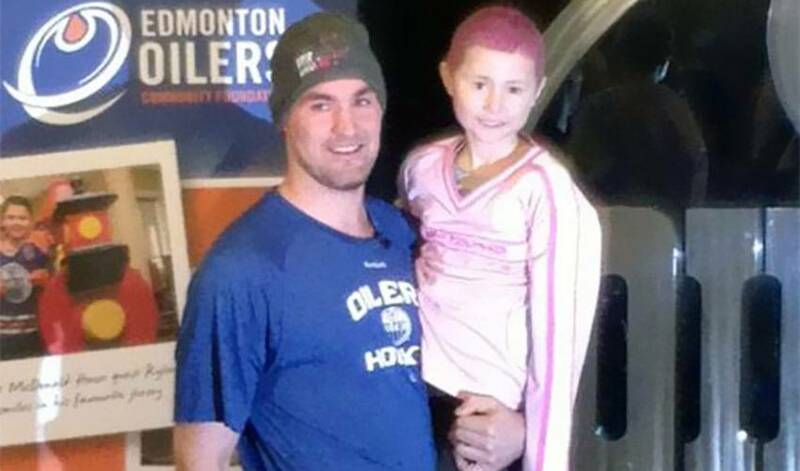 The young Alberta girl – and huge hockey fan – was diagnosed with Leukemia just before Christmas in 2013. Now, all Gazdic needs to do is meet the one the player he’s always wanted to. Guys that happen to be just like Luke Gazdic.